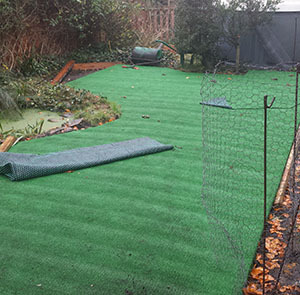 Installing Artificial Grass is a fairly straight forward process; however we tend to receive the same queries from first time installers upon ordering and during delivery and installation. How long can I keep the Artificial Grass in a roll before installing it? Since production the grass has been stored rolled up, so as long as you like. The grass is supplied on a cardboard core and wrapped in plastic. Ideally you want to store the roll on a flat surface so that the roll does not bend, this way it’s easier to fit when the time comes. I want to order 30 square metres of Artificial Grass for delivery tomorrow…..
That’s great and we can certainly get it to you overnight, however the square metres do not tell us want you will need. Rolls width can be 2m/3m/4m so your 30m2 could be a 2mx15m or 3mx10m or 4mx7.5m. The longest and widest measurements of the area will give us a much clearer understanding of your requirements. Can I order extra length to cut off and make up a shortage on the width? You need to consider the pile direction. Using the extra length will normally require a turn of pile direction and result in a colour shade difference. The grass I received looks flat and nothing like the height specified or sampled? Unlike a carpet, Artificial Grass cannot be just unrolled and trimmed to size. The blades of grass are compressed as flat as possible in the factory to reduce the roll diameter. You will need to use a stiff broom to aggressively brush the grass. Professional installers use a powerbroom to quickly cover larger areas, as shown in this YouTube Clip. A standard stiff bristle broom is just as good but will just require greater effort. Upon unrolling the grass it is discoloured in darker “bands” that run across the width of the roll? These are pile pressure bands that give the visual appearance of discolouration. It is caused by the weight of the roll compressing the bottom section more than the top section when stored rolled. The banding will improve once the grass is brushed or powerbroomed and will fully disappear once the pile becomes non directional.